Parts Used: The ripe fruit. The leaves. V. arboreum, or Farkleberry. This is the most astringent variety, and both berries and root-bark may be used internally for diarrhoea, chronic dysentery, etc. The infusion is valuable as a local application in sore throat, chronic ophthalmia, leucorrhoea, etc. V. resinosum, V. damusum, and V. gorymbosum have properties resembling those of V. myrtillus. The Bog Bilberry ( V. uliginosum) is a smaller, less erect plant, with round stems and untoothed leaves, greyish green beneath. Both flowers and berries are smaller than those of the common Bilberry. This kind is quite absent in the south and only to be found in mountain bogs and moist copses, in Scotland, Durham and Westmorland. Constituents: The leaves contain glucoquinones, which reduce the levels of sugar in the blood. The skin of the fruits contains anthocyanin and is specific in the treatment of hemeralopia (day-blindness). The fruit is a rich source of anthocyanosides, which have been shown experimentally to dilate the blood vessels. 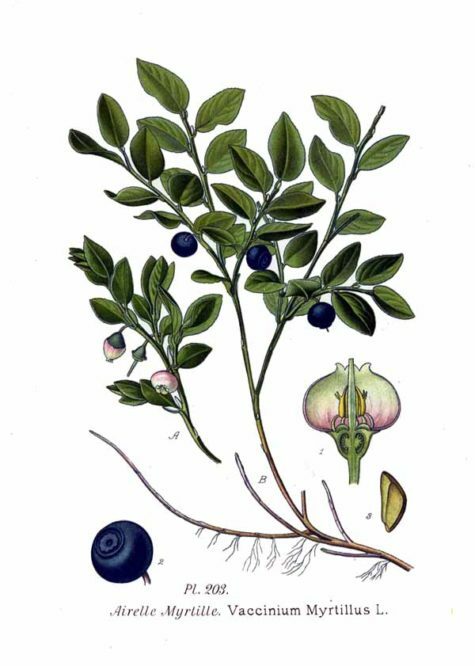 Although often called huckleberry, the bilberry is more nearly related to the cranberry. 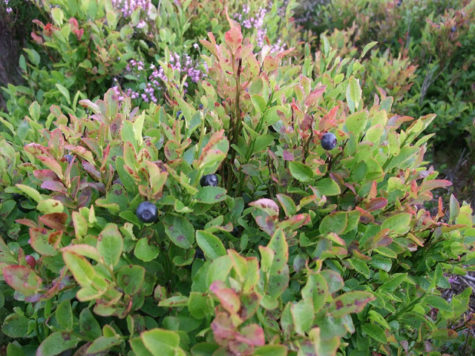 Vaccinium myrtillus has been used for nearly 1,000 years in traditional European medicine. Bilberry fruits have been used in the traditional Austrian medicine internally (directly or as tea or liqueur) for treatment of disorders of the gastrointestinal tract and diabetes. Herbal supplements of V. myrtillus (bilberry) on the market are used for circulatory problems, as vision aids, and to treat diarrhea and other conditions. Bilberry is a well-known folk remedy for poor vision, especially for people who suffer from “night blindness,” that is, they have difficulty seeing in the dark. In fact, bilberry jam was given to Royal Air Force pilots who flew nighttime missions during World War II. It works by accelerating the regeneration of retinol purple, commonly known as visual purple, a substance that is required for good eyesight. European medical journals are filled with studies confirming bilberry’s positive effect on vision. Unfortunately, this herb has not received the attention it deserves in the American medical community so far. Some people use bilberry for conditions of the heart and blood vessels including hardening of the arteries (atherosclerosis), varicose veins, decreased blood flow in the veins, and chest pain. Bilberry is also used for chronic fatigue syndrome (CFS), hemorrhoids, diabetes, osteoarthritis, gout, skin infections, gastrointestinal (GI) disorders, kidney disease, and urinary tract infections (UTIs). The dried leaves of bilberries are used in the treatment of a variety of complaints. A tea made from the dried leaves is strongly astringent, diuretic, tonic and an antiseptic for the urinary tract. It is also a remedy for diabetes if taken for a prolonged period. Another report says that the leaves can be helpful in pre-diabetic states but that they are not an alternative to conventional treatment. The leaves contain glucoquinones, which reduce the levels of sugar in the blood. A decoction of the leaves or bark is applied locally in the treatment of ulcers and in ulceration of the mouth and throat. It is sometimes applied directly to the inside of the mouth for mild mouth and throat soreness. A distilled water made from the leaves is an excellent eyewash for soothing inflamed or sore eyes. Whilst the fresh fruit has a slightly laxative effect upon the body, when dried it is astringent and is commonly used in the treatment of diarrhea etc. The dried fruit is also antibacterial and a decoction is useful for treating diarrhea in children. The skin of the fruits contains anthocyanin and is specific in the treatment of hemeralopia (day-blindness). The fruit is a rich source of anthocyanosides, which have been shown experimentally to dilate the blood vessels, this makes it a potentially valuable treatment for varicose veins, hemorrhoids and capillary fragility. Several varieties of the subgenus Mahonia contribute to the drug of commerce under the name of Berberis aquifolium. It is a quickly-growing shrub about 6 feet high: the oddly compound leaves have no spine at the base; they are evergreen and shining. The flowers grow in terminal racemes, are small and yellowish-green in color, and the purple berries are three- to nine-seeded. The bark is brown on the surface and yellow beneath. The root is from 1/2 inch in diameter to 3 inches at the base of the stem, odorless, and with a bitter taste. 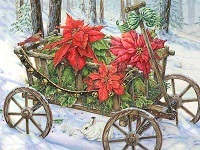 The shrub was introduced into England from North America in 1823. It was formerly known as Mahonia aquifolia and is very hardy. Note:It should not be used with Glycyrrhiza species (Liquorice) because this nullifies the effects of the berberine. 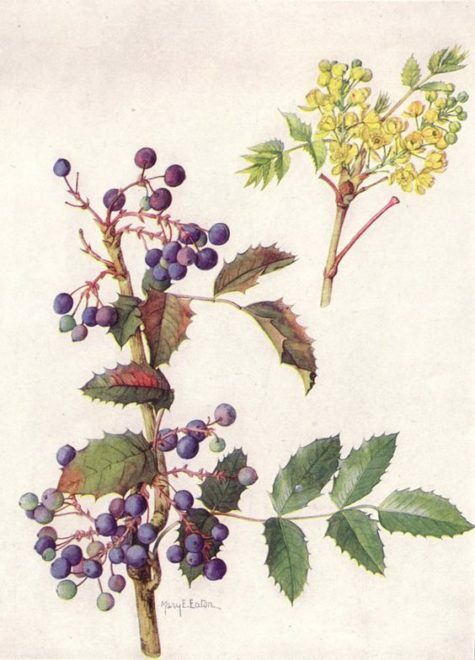 Oregon grape was often used by several native North American Indian tribes to treat loss of appetite and debility. Its current herbal use is mainly in the treatment of gastritis and general digestive weakness, to stimulate the kidney and gallbladder function and to reduce catarrhal problems. The root and root bark is alterative, blood tonic, cholagogue, diuretic, laxative and tonic. It improves the digestion and absorption and is taken internally in the treatment of psoriasis, syphilis, haemorrhages, stomach complaints and impure blood conditions. Externally, it has been used as a gargle for sore throats and as a wash for blurry or bloodshot eyes. The blue fruits are tart and improve after frost. They are often gathered for jelly or wine. Used to treat a wide variety of ailments, Oregon Grape species contain the extremely potent alkaloid, berberine, (also found in goldenseal) which is antiseptic and stimulates the liver and spleen. The fruit is an excellent gentle and safe laxative. Berberine, universally present in rhizomes of Mahonia species, has marked antibacterial effects and is used as a bitter tonic. Since it is not appreciably absorbed by the body, it is used orally in the treatment of various enteric infections, especially bacterial dysentery. It is one of the best alterative blood purifiers and liver stimulants. Uses for the Oregon Grape Root include weak digestion, flatulence, jaundice, blood impurities, and as a general tonic to the whole system. A decoction (instructions below) will be found to be a wonderful blood purifier and will restore health to many who are suffering from a sluggish liver, weak stomach, indigestion, and sallow skin.